1. Arrange 1 rack in lower third of oven. Preheat oven to 350°. 2. Combine brown sugar, flour, and salt in a medium heavy saucepan over medium heat, stirring well with a whisk. Stir in corn syrup, and bring mixture to a boil. Cook for 1 minute, stirring occasionally until sugar dissolves. Remove from heat. Add butter and chocolate; stir with a whisk until smooth. Cool to room temperature; stir in walnuts, vanilla, and eggs. 3. Fit pie dough into a 9-inch round removable-bottom tart pan coated with cooking spray, pressing dough into the bottom and up the sides of the pan. 4. Spoon walnut mixture into prepared crust. Bake on bottom oven rack at 350° for 33 minutes or until set. Cool for 20 minutes in pan on a wire rack. 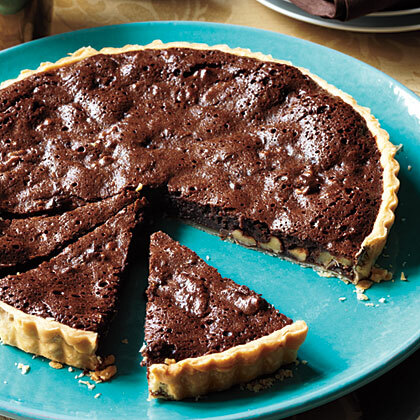 Remove sides of tart pan; slide tart onto a serving platter. Cut into wedges.